Index funds are funds that invest in an Index. These funds purchase all the stocks in the same proportion as in the specific index. This means the performance of Index fund is dependent on the performance of the Index. These funds are not designed to outperform the market, but to mimic the performance of the index. The index could be Nifty, Sensex etc. These types of funds do not require active management. This means the expense ratio of these funds is very low. For example, UTI Nifty Index Fund – Direct plan has an expense ratio of 0.12%. It is very low compared to active fund where you will generally find expense ratio above 2%. 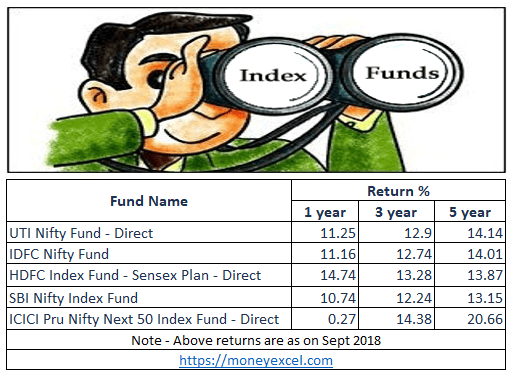 In this post, we will try to get complete insight about Index fund. Index Funds are mutual funds that emulate the portfolio of an index. As these funds are not managed actively and tightly coupled with index another name given to index funds are passive fund, index-tied or index-tracked mutual funds. Suppose index fund is tracking benchmark index Nifty, in that case, a portfolio of this fund contains 50 stocks of Nifty in the similar proportion. The index fund replicates benchmark index performance. The main advantage of an Index fund is low cost as they don’t require much effort of management. The low cost translates into better returns. These funds are the cheapest and easiest way to diversify your money. These funds are low-risk fund for the investment. This fund removes the real risk of fund manager error as the involvement of a fund manager is required only for tracking index and change in investment accordingly. Buying these types of funds means buying the performance of the index. There are three types of Index Funds. Index Plus Fund – Invest in Index stocks and partially in actively managed assets. There are various qualitative and quantitative parameters for the selection of index funds. Few parameters among these are given below. The primary factor for shortlisting is tracking error. Lower the tracking error better is the index fund. It is a parameter that reflects an ability of a fund to replicate the performance of the benchmark index. Tracking error is not available as a specific parameter. One needs to compare the performance of the fund with a benchmark index to get an actual idea. Another important factor of comparison is the expense ratio. Lower the expense ratio better is fund performance. Top 5 Best Index Funds purely based on past 5 years performance are given below. Note – The above top index funds are shortlisted purely based on performance. One should not consider above fund as recommendation of investment. Investment decision in index funds is purely depended on risk appetite and financial goal. However, these types of funds are suitable for investors with the following characteristics. Low-risk investor who is looking for foreseeable returns. An investor who don’t have a time of extensive tracking. An investor who is happy with index equivalent returns either Sensex or Nifty. An investor looking for good diversification benefits across sectors. Low-cost moderate returns mutual fund for the long term. These funds are made to replicate the return of an index. If you are looking for higher return compared to index you should avoid index funds. If you are planning to invest in Index funds, it is recommended to go for Index plus fund.